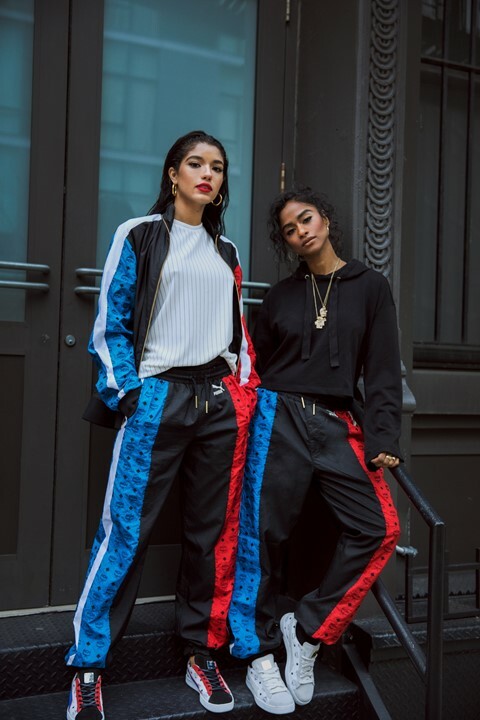 While Puma and luxury leather goods brand MCM are not two brands you’d automatically put together, as two labels that are often inspired by hip hop, they make the perfect pairing for a new collaboration. The first time the two have joined forces, the new collection celebrates 50 years of Puma Suede and fuses both streetwear and high-end styles. Inspired by the 80s, the collection includes two monogrammed tracksuits and three pairs of trainers, a new take on the legendary Puma Suede bearing the iconic MCM Visetos logo. Shot in an urban setting, the campaign images see models wearing the new items in a unique, music-inspired setting, with speakers as props. MCM first teased the collection at Tribeca Film Festival in April where its documentary The Remix: Hip Hop x Fashion was premiered. Highly awaited since then, the collection is now available online and in stores worldwide.